entrants only and must be 18+ to enter. We love our new Giwil towel. It is super absorbent, antibacterial, and fast drying. This towel is perfect for the Beach, the Gym, or Home use. I’ve never loved a towel so much. My 6 year old, son, uses it, for everyday use, and it dries so quickly, it’s unbelievable. We just hang it up, and it seems like, in a short time, it’s ready for use again. It’s extra large size is perfect for Jacob, and it’s so lightweight that you don’t even know you are carrying it. It’s fabulous. I can’t get used to how fast it dries, it’s really remarkable. And, my sister in law uses her towel at the Gym. She says it’s very absorbent, and she loves it as well. It’s just a great product to have around, for last minute needs. 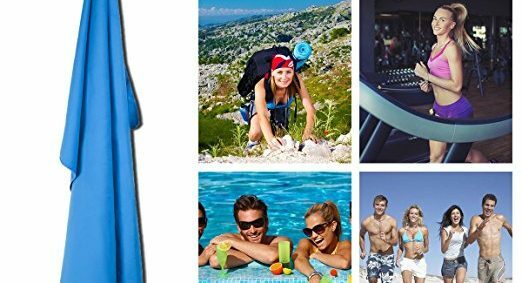 EXTRA LARGE (70″ x 35″) BUT LIGHTWEIGHT: Giwil microfiber towel is large enough to double as a microfiber bath towel or beach towel! You can dry your skin from head to toe quickly with this towel. While generously sized, this microfiber travel towel packs down tight for easy portability, total weight is just 10oz (0.3kg) . PLEASANT, SUPER-SOFT TEXTURE & ANTIBACTERIAL: Make that lump of damp, heavy material in your bag a thing of the past…! Our Giwil microfiber towel used the finest microfiber, thinner than SILK, these fibers went through an advanced softening process, thin and compact, but soft. 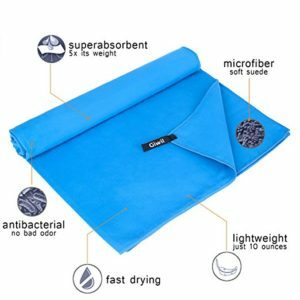 The microfiber fabric is antibacterial, helping to inhibit odor and germs, so you don’t have to worry about mold, mildew, or that horrible gym-towel stink. QUICK DRYING & HIGHLY ABSORBENT: Made of 100% Micro-Fiber and dry up to 10X faster than normal terry cloth or cotton towels, can quick to wick away sweat and water from your skin, not only are these tough and long lasting, but they’re also soft on the skin.Quick drying. Just hang it outside for a few minutes and you can quickly use it again. You can also use it as a handy travel blanket or travel pillow. 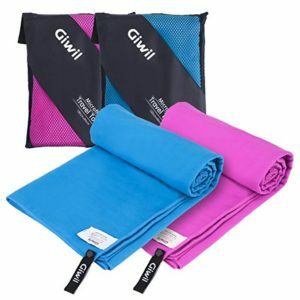 MULTI USE: Giwil microfiber towel can be used as travel towels or sports towels. 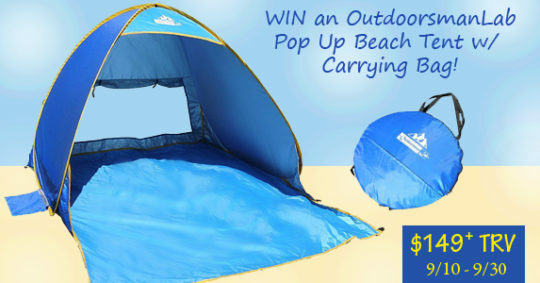 Ideal for beach, travel, camping, swimming, backpacking, gym. Please wash your towel before first use. If you are not completely happy with your purchase for whatever reason, let us know and we’ll do our best to make it right for you. It is also a wonderful yet practical gift idea for your active friends and family! CUSTOMER CARE PROMISE: Giwil offers complete customer satisfaction, period. Our customers are more important than a sale. If for any reason you are not absolutely happy with your travel towel, we will replace or refund your order, no questions asked. CONTACT US directly and we will take care of you. We love to help!